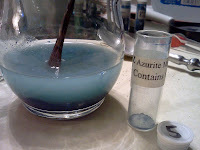 Azurite is an import pigment in the history of manuscript painting, for centuries filling the pages of many a medieval codex. It is a natural, soft, copper-carbonite mineral and is almost identical in structure to malachite with both "result[ing] in differences of color saturation the finer the particle size of the pigment." This leads to an amazing diversity in saturation for the blues (and greens) that can be obtained from this mineral. 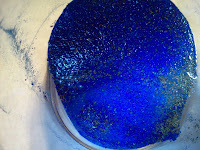 However, the one small caveat is that because azurite is considered a "soft" mineral, grinding and mulling must be avoided so as not to ruin the richness of the larger particles. Medieval artists were craftsmen who had a deep, comprehensive understanding of their tools, materials and techniques. 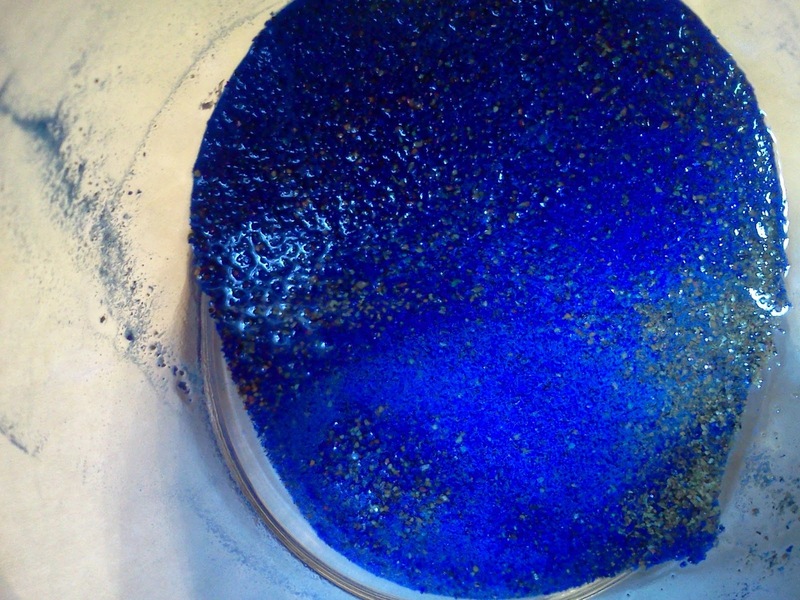 They knew that the largest particles of azurite produce a deep royal blue and that the smallest had a much lighter sky-blue hue. They were unable to grind or mull azurite so they found other methods for separating the differing particle sizes into usable pigment. Reading any of the various period artist treatises will show that the preferred technique for preparing azurite was washing and levigating. These techniques assume that the azurite has been broken from its solid rock form and ground lightly so that it's chunks are no smaller than say gritty sand. This ensures that the broken particles remain quite large while also inevitably creating smaller particles as part of the crushing process. 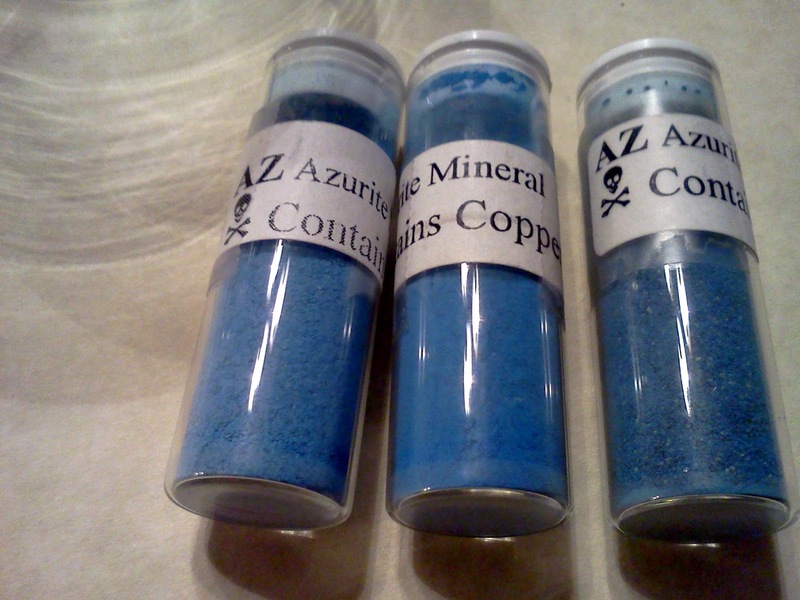 The purchased vials of azurite currently available to me are already at a point of being the texture of fine sand which means that to crush them any more would cause further colour loss. Since I am after the darkest blue possible I chose to work with the vial with the largest visible particle size (far right vial, fig.1) which also happened to be the most gray-looking of the three, which I now assume to be due to the impurities. Using a technique translated from the Bolonese manuscript by Mrs. Mary P Merrifield , the contents of the vial were dumped unceremoniously into a small glass jar and then covered with distilled water. Once wet you can really see the difference in colour of the various particle sizes, ranging from a deep royal blue to a very ashy gray-blue (fig. 2). The whole point of these levigation techniques is to separate these various particle sizes for more even tone. Agitate the particles so that they are distributed throughout the water and then set the jar down for a few minutes to allow the larger particles to settle. You will notice an almost immediate settling of the largest particles, followed by those that are smaller. For my initial passes of levigating I allowed the particles to settle for about 3 minutes so as to keep all but the smallest grains. Once settled the coloured water containing these smallest particles was then poured off into a second jar. 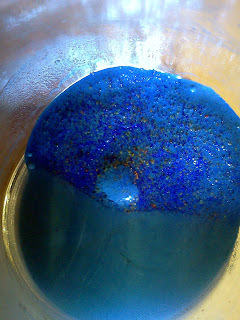 This process was repeated a number of times until I was pouring off almost clear water, which left me with a very bright almost royal blue in my original glass (fig. 4) and a murky blue in the second jar. Even though the water being poured off is now mostly clear, there's still more refining to do so that you end up with the purest divisions of particle sizes. The process above is repeated, however this time you allow for minimum particle settlement. This means that as soon as the heaviest particles have dropped to the bottom the water is poured off into your second jar. I found that settlement was happening in less than 60 seconds. There comes a point where you have immediate particle drop and clear water, congratulations - you're done. Well, with the biggest particles anyway! Now the only thing left to do is successively repeat this process with the particles in your second glass so that you eventually end up with a number of jars of different sized pigment particles. If you line these jars up you will see how the larger particles are darker in colour and the smaller particles are much lighter, while the smallest probably look very gray and murky. Fig. 5: Three different particle sizes separated from the original vial (fig. 1). To start with, there where a lot of impurities in the original vial which I didn't notice until I started levitating, you can see this in a number of the photographs as yellow / gold "flecks". I've been told that there's a way of removing these impurities with Roman-soap and woos-ash lye, but further experimentation is needed. I could also have sped up the separation process by not letting the initial series of washing settle for so long since we're initially after the largest particles and they settle quickly. Save the lengthy settling times for further into the process when you're after the smaller particles. I should also have used a larger "discard" bowl for the pouring off so as to be a little more efficient. 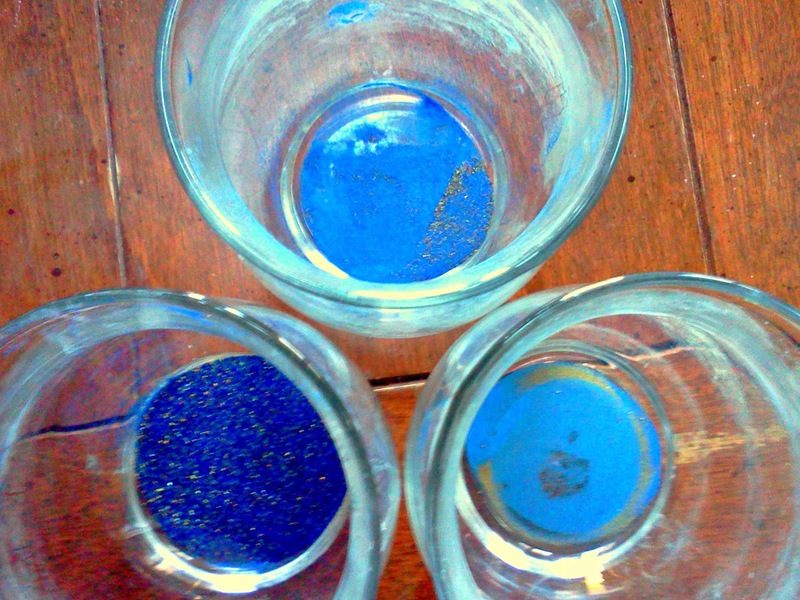 Natural Pigments: Making Water Based Paints. - "On the left side is dioptase pigment ground fairly coarse (0–125 microns) and on the right is dioptase ground to less than 60 microns. Dioptase is one of a group of natural mineral pigments with vitreous crystalline structures, which result in differences of color saturation the finer the particle size of the pigment. Not all pigments improve in color and appearance by being ground to a very fine powder and then mixed with a binding medium. For example, the natural mineral malachite loses its color saturation the finer it is ground. On the other hand, some pigments, like cinnabar and lazurite (lapis lazuli) improve their chromacity when grinding to the finest possible particle sizes." 168. How azure is prepared and purified. - But I shall not conceal how I purify it when it comes to my hands. I first pour it into a bason, and put a little water along with it, and rub it with my finger until it is thoroughly moistened, and then I pour in more water and stir it well, and let it rest. When it has settled, I pour off the water, turbid from the impurities, into another vase, keeping the precious colour which remains at the bottom of the vase, for its nature is such that the finer and purer the colour is the heavier it is,and therefore the sooner it reaches the bottom; and the impurities, or the whitish or yellowish parts, which are lighter, float or remain above it in the water. And, if necessary, I repeat this process several times, pouring water out and in until it is purified; . . . (Merrifield 134). ASPLUND, Randy. "Re: Pigment, Binders and Skin Prep." Message to Randy Asplund. Oct. 31. 2012. E-mail.